Rule #1: For healthy eating to become a habit, it’s gotta be doable. When I talk to clients, I spend less time talking about “what” and more time focusing on the “how”. How are you going to add more vegetables into your diet? How are you going to find time to head to the gym a few times a week? The what tends to be easy, but figuring out the how is where real change happens. Eating on the run tends to be a difficult how. With so many fast food options, lack of planning and plenty of excuses, lunch can either make or break a healthy eating schedule. While many RDs will tell you that breakfast is the most important meal of the day, my emphasis trends toward lunch. For those of you with kids or live-in partners, lunch is one of the few meals that you get 100% control over. 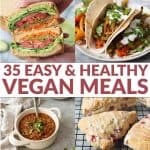 Whether you eat at home, at your desk, or in the car, lunch usually allows for personal choice without having to factor in others’ needs and wants, like breakfast and dinner typically require. So choose wisely! 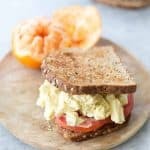 If dinner means sandwiches on the way to soccer practice, let lunch be the place where you pack in vegetables, fruits, and healthy whole grains. Here is a typical lunch for me, and how I pack it. First up, this Blood Orange smoothie. I’ve been in citrus heaven lately and trying to come up with creative ways to enjoy oranges- instead of just peeling and eating. This blood smoothie is typically my first course for lunch. Since I am usually eating in-between clients and meetings, my lunches typically occur in phases over the course of at least an hour. A few bites here and there maintain my energy while increasing my focus on the task at hand. The smoothie is the perfect way to ease into lunch. 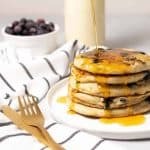 You could also pack and enjoy it for breakfast or a mid-morning snack! 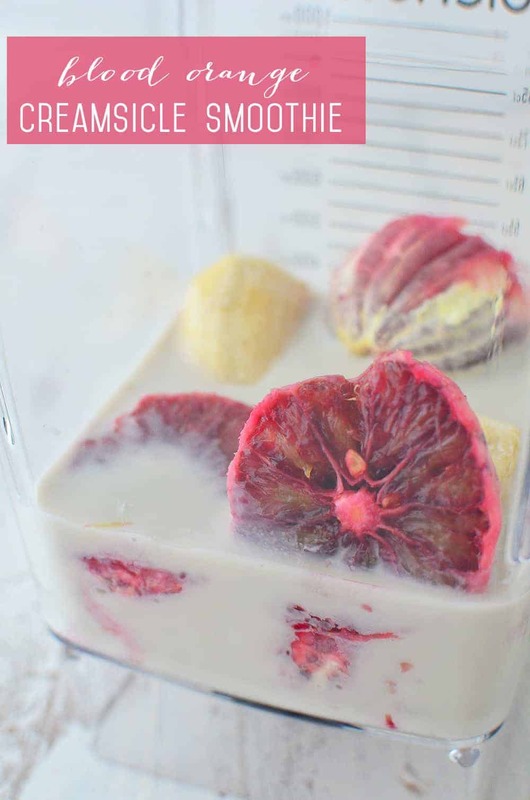 Blood oranges, almond milk and a frozen banana come together for a delicious, sippable creamsicle. 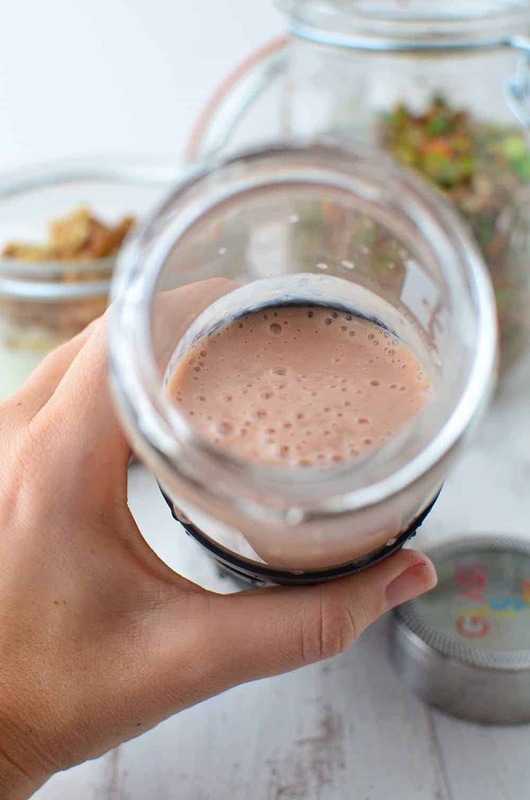 I pack it in my glass smoothie jar and give it a quick shake before drinking. Last year, I decided to clean out our tupperware cabinet for good! I was sick and tired of trying to match the lids to the correct bottom only to find out one of them had warped from the heat of the dishwasher. I also started to read more and more about BPA and just decided that I wanted to limit as much food in plastic as I could. These glass jars became a natural replacement. I love that glass is a sustainable and more environmentally friendly choice. 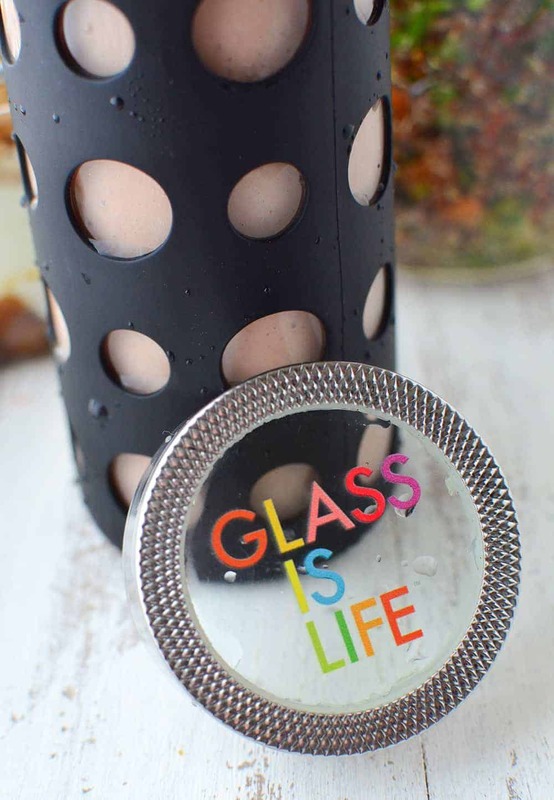 Plus, how cute are these glasses?! For a fruitier smoothie, swap orange juice (regular or blood) for the almond milk. Next up, the main event- my quinoa tabbouleh. I’ve been obsessed with tabbouleh ever since I was a kid. To keep things simple, my mom swore by the Near East box, just add fresh parsley, tomatoes and toss together. I love it just as much today as I did back then, but now I’ve put my DK spin on things. While I love bulgur wheat, I’ve replaced it with quinoa. More protein and faster cooking time! I also removed the tomatoes and added in roasted vegetables. This way my tabbouleh doesn’t get soggy, and I’m able to get a few lunches out of one batch. The beautiful thing about tabbouleh is that it’s pretty customizable, which is exactly how I roll when I am in the kitchen. I rarely fret about exact ingredients, especially with grain salads like this one. Use whatever roasted vegetables you like, same goes with the herbs. Preheat oven to 400 degrees F. Toss carrots and tomatoes with 1 tsp. olive oil and a pinch salt/pepper. Place on a roasting pan or baking sheet and cook for 15-20 minutes until browned and tender. 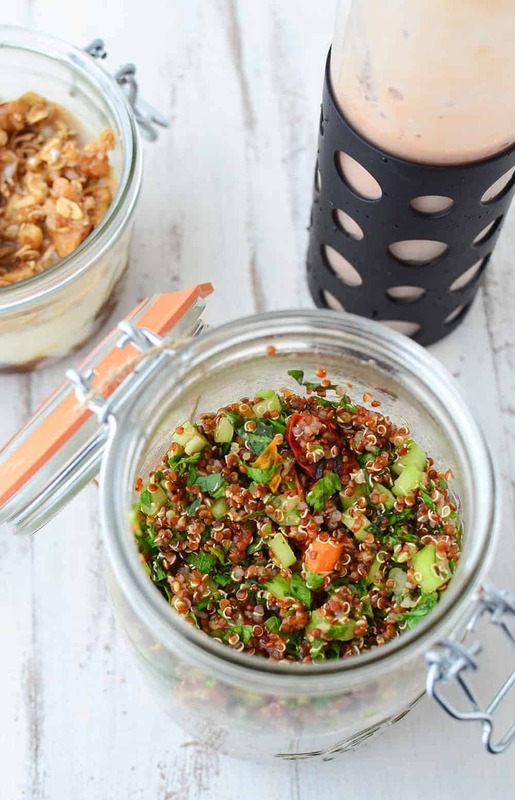 While the carrots and tomatoes are cooking, make the quinoa. Rinse quinoa in a fine colander (this removes any bitter flavor). Place the quinoa and 2/3 cup water into a saucepan and bring to a boil. Reduce heat to low, cover and let cook for 12-13 minutes until water is absorbed and quinoa is fluffy. Let stand a minute or two off heat and then fluff with a fork like you would rice. Set aside to cool. In a large bowl, combine the quinoa, carrots and celery. Whisk in the lemon juice and remaining olive oil. Add in the chopped herbs and season to taste with salt and pepper. To finish things off, dessert. Depending on how much of my smoothie and quinoa tabbouleh I eat, I may save this yogurt parfait for an afternoon snack. You can get the full recipe for my Dried Plum & Walnut parfait here. 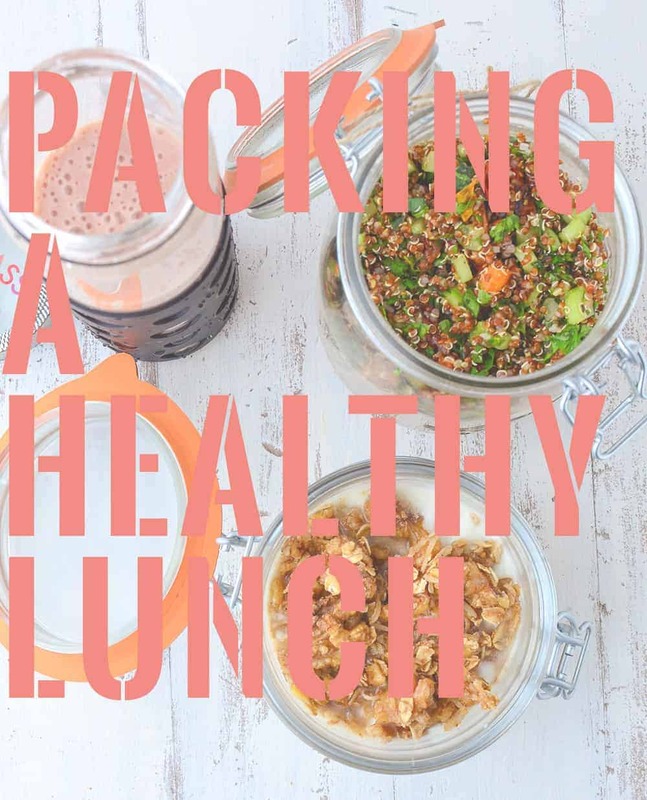 What are your favorite tips for packing a healthy lunch? 2 simple wonderful recipes! So easy to make! These are all great suggestions! I pack a lunch for my husband every day (yes, I’m one of those) but feel really restricted since he refuses to take anything that requires refrigeration or reheating due to his limited time. My tips would be to get some good containers like you said and use something to keep your foods cool so that you can pack real, filling food. Also, making extra food at dinner so you can easily pack leftovers for lunch the next day is an easy route to go. It’s OK- I pack my husbands lunch every day too 😉 it’s just easier and I don’t mind sharing that part of our household at all! GREAT tips! i am lucky that we both have refrigerators and microwaves in our office, which is a lifesaver if I want leftovers or fresh salads. Thanks for the tips! Thank you SO much for sharing non slow cooker recipes- As nice as they are, we are in the peak of Summer here! For packing a healthy lunch, I love a good weekend food prep- some proteins and starchy carbs and good to go! Yes! Weekend food prep is a MUST! Honestly, when we are away for the weekend and I don’t have time to prep, I know my weekday diet suffers greatly! Thanks for your tips Arman! My lunches often look the same, either shredded chicken or turkey sloppy joes with green beans and roasted sweet potatoes!